Does Stress Make Us More Susceptible to Injury? What do finals week, the first few months after having a child, and housebreaking a puppy with (seemingly) the world’s tiniest bladder have in common? Well, all are potentially stressful moments in life, when experience (and research) suggests that we are more likely to catch a cold. And sure, colds are inconvenient and unpleasant of course, but at least we’re usually back to our old selves within a week or so. 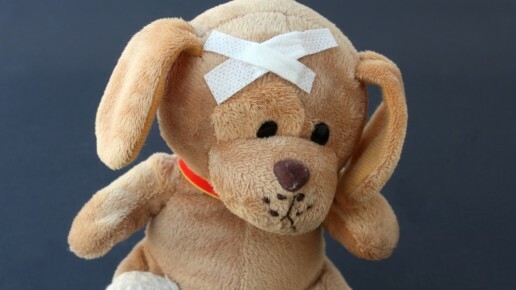 Injuries, on the other hand, can be much more debilitating and take far longer to recover from. Wait…hold on a sec. Injuries? One of the most stressful periods in my life was senior year of high school. After all, there were fall semester grades to worry about, SAT’s to study for, college application essays to write, competition tapes to make, auditions to prepare for…and not enough time in the day to do everything. And curiously, it was the only time I’ve ever experienced a playing-related injury. Could that just be a coincidence? Or are stress and injuries potentially related in some way? A team of researchers at the University of Missouri wondered the same thing, and analyzed injury data from the school’s football team to see if there was any relationship between the school’s academic calendar and players’ injuries during the season. 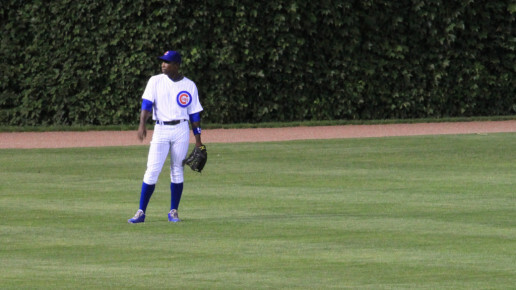 They started by dividing the season into three basic periods. 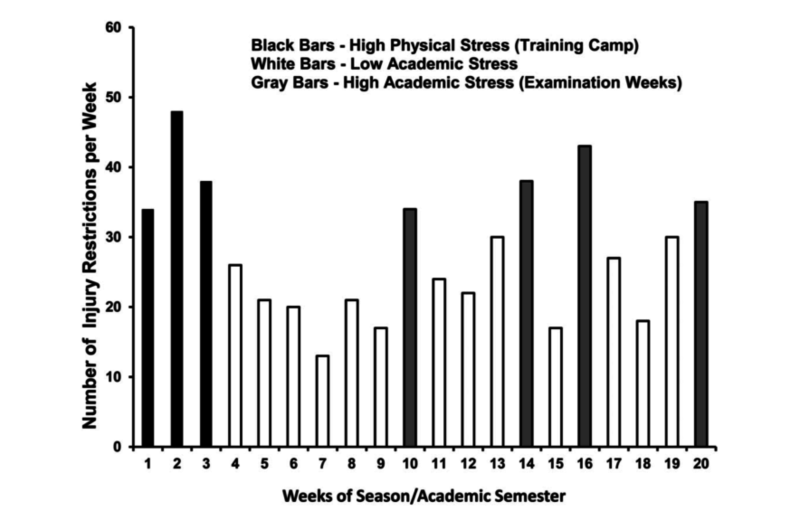 The first 3 weeks of the season – training camp – was categorized as a period of High Physical Stress. University-wide exam weeks (like midterms and finals) were identified as periods of High Academic Stress. All other weeks were considered periods of Low Academic Stress. From Mann, J. B., Bryant, K. R., Johnstone, B., Ivey, P. A., & Sayers, S. P. (2016). 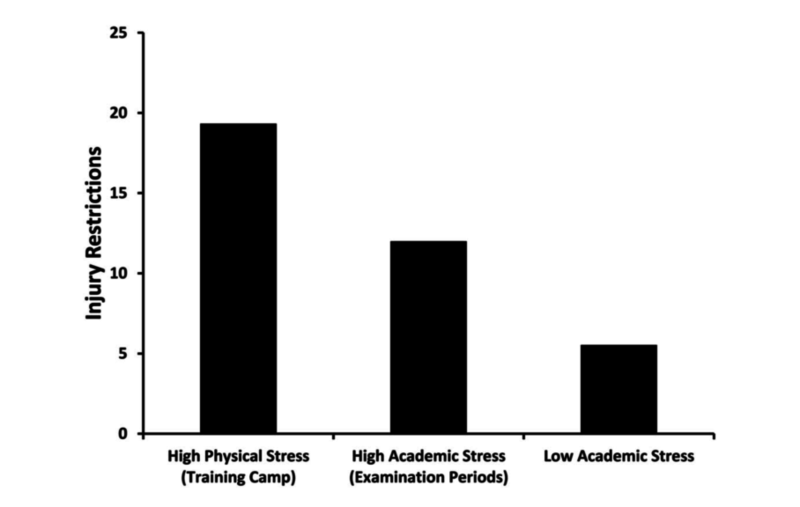 Effect of Physical and Academic Stress on Illness and Injury in Division 1 College Football Players. Journal of Strength and Conditioning Research, 30(1), 20-25. Out of 101 total athletes on the team, 60 suffered injuries that were serious enough to restrict their activities in either practices or games during the 20-week season. So then the question became about timing. Did these injuries occur randomly throughout the season? Or were they clustered around periods of high physical or academic stress? Well, as you might imagine, there tended to be more injuries during training camp, when the athletes were going through longer and more intense workouts. To be exact, there were twice as many injuries during high physical stress weeks than during high academic stress weeks. And four times as many injuries as during low academic stress weeks. But more intriguingly, and more relevant to the question at hand, there were almost two times as many injuries suffered during exam weeks than during non-exam weeks. The researchers then looked even more carefully at the injury data. Specifically, they looked at injury data for just the starters and those who actually got playing time during the season. Among those who played in games, the “stress effect” was even more pronounced, with three times as many injuries occurring during exam weeks as compared with non-exam weeks. And among these active players, there was actually no difference in the injury rate between periods of high physical stress and periods of high academic stress. In other words, among those who actually played in games from week to week, high academic stress appears to have been just as important a factor in injuries as high physical stress. The authors propose a number of explanations for these findings. For instance, they suggest that non-starters may have tried harder during training camp, putting themselves at greater risk of injury in trying to impress coaches and earn a starting position. But what’s actually going on in this relationship between stress and injury? What is it that makes an athlete more prone to being injured when stressed? How does stress increase risk of injury? Several theories and models have been proposed over the years, and while there is probably no single link between stress and injury, the basic idea is that when stressed, we may be a) more distracted and/or b) more physically tight, which increases our risk of injury. And yes, football involves way more physical contact with a whole set of unpredictable variables than playing the piano or trombone. But other studies have found similar trends between stress and injury across a range of individual sports, from gymnastics to skiing to track and field. Well, I don’t think the answer is to avoid stress altogether (as if we could). And it’s not like stress is the primary cause of injury, but more like the straw that broke the camel’s back, exposing underlying muscle imbalances, suboptimal biomechanics, etc. To me, it seems that the main takeaway is about being wary of overlooking how much of an effect stress can have on not just our mental or emotional well-being, but our physical health as well. That it’s during stressful times in life when we may most need to keep our spidey-senses attuned to the physical tension that can creep into long orchestra rehearsals, marathon opera performances, or recording sessions from the stressors in our lives offstage. And while it’s during periods of high stress that we feel we can least afford to take a study or practice break – paradoxically, these might be the times when we need it the most. So rather than priding ourselves on a relentless, more-is-better work ethic, perhaps we should experiment with being just as relentless about incorporating strategic breaks to maintain our focus and recharge our batteries. Like a well-timed nap. A walk to clear your head and get unstuck. An evening with friends. Or even a thought-provoking documentary on Netflix.